1. I have a puppy. And puppies require attention. So my time for things such as sewing, singing and blogging are somewhat limited to when he sleeps. 2. I've been sick. And it wasn't just a cold. It was a terrible flu virus thing that had me on the couch without being able to get up without fainting for 10 days. 3. It is spring. And I enjoy spending time outdoors, rather than in front of a computer screen when it is 75º, with a light breeze, sunny, birds singing, ducks swimming in the pond and altogether perfect weather. Okay, so now I've got rid of those excuses, let's get down to sewing, shall we? Prepare yourself for a picture-heavy post. 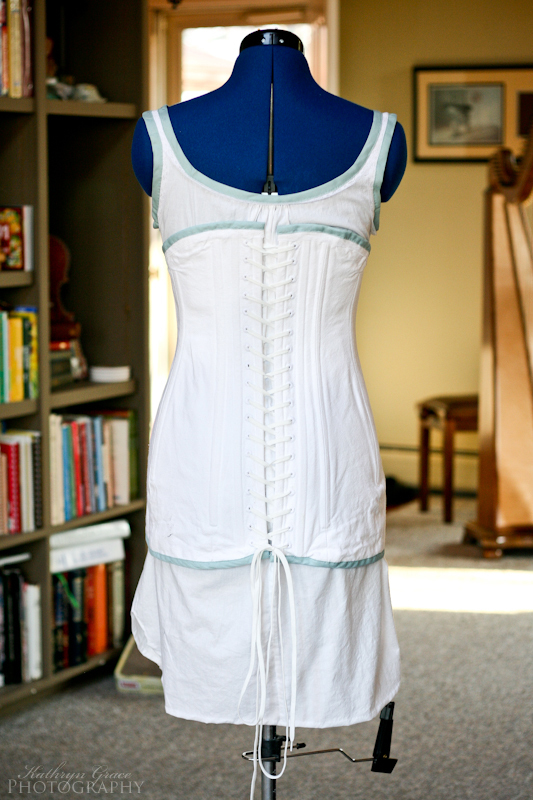 Late is better than never, and I'm finally getting pictures of the 1912 corset and chemise that I made a while ago. 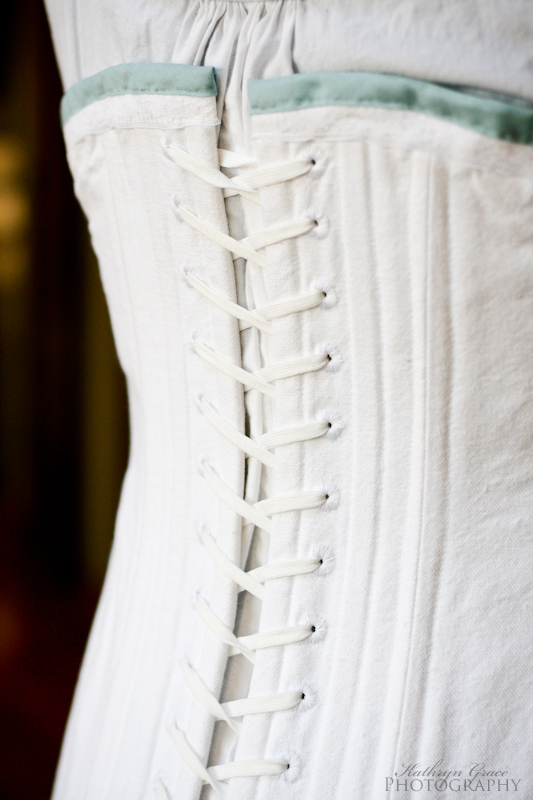 I already told you about the corset here and here, so I won't talk too much about that. 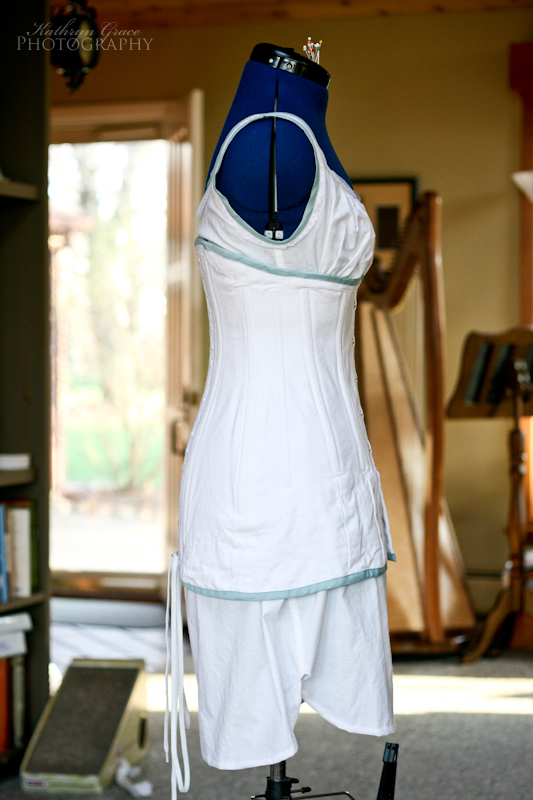 The chemise I made without a pattern, just fitting it on the dress-form. I had the basic idea of how I wanted it to look in my head, and just pinned and cut until it was what I wanted. 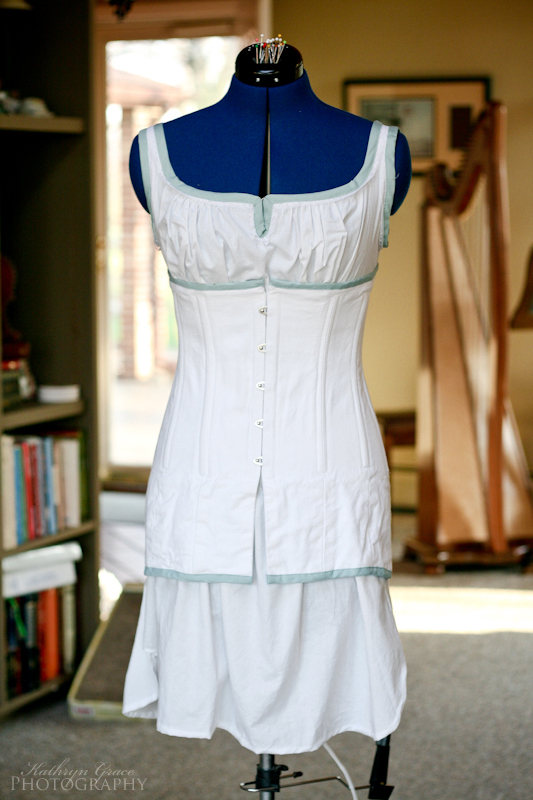 To make it match the corset, I put the blue trim on the top and arm-cycles and added lace. I rather like it. Apologies for the wrinkles... it's had the corset on it for the past few weeks! 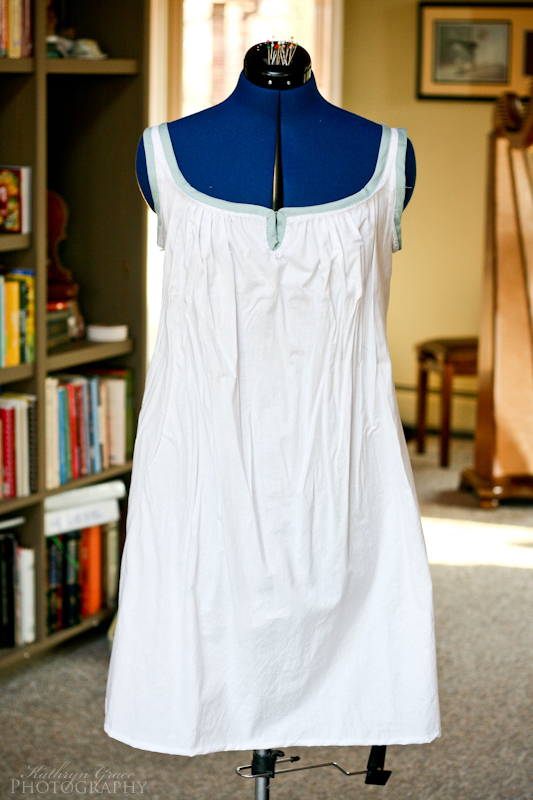 Eyelets down the back. 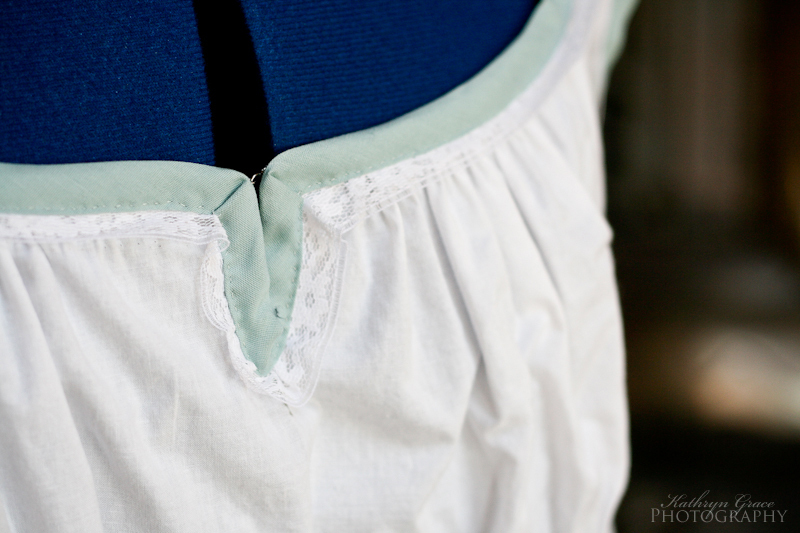 It's so exciting when you finish the last one and then look at your neatly hand-sewn eyelets! Recently my friend came over for two days and we sewed a colonial dress for her. 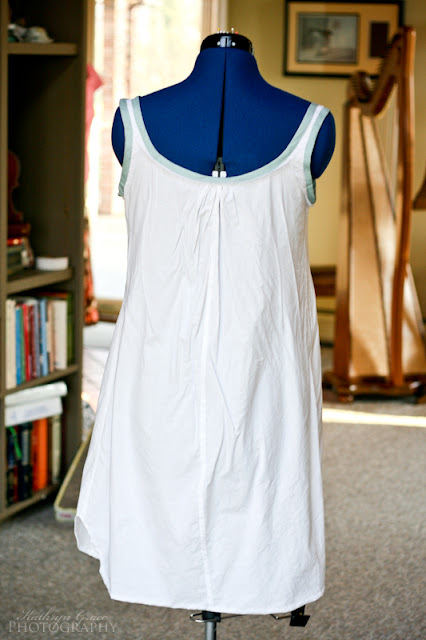 It was a really fun project, and I loved the fabric she chose. It suited her perfectly! 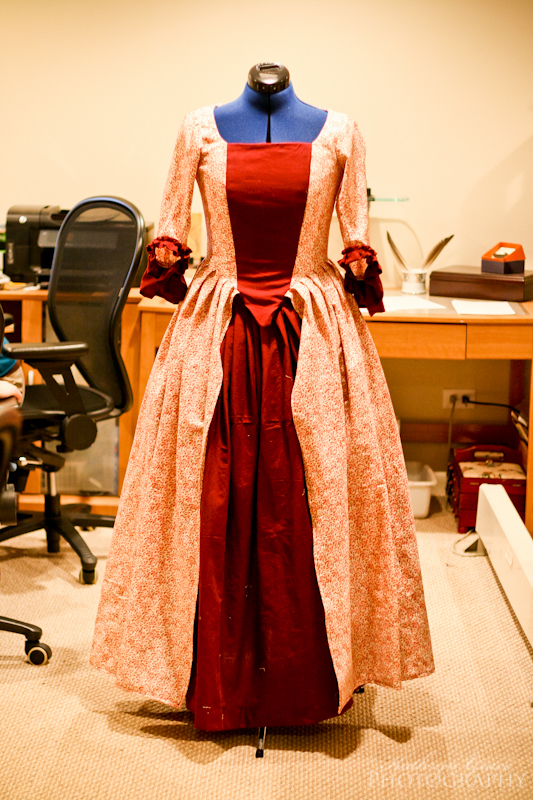 We used this pattern, but did a different sleeve ruffle, (no flounce and lace), and altered the bodice to fit right. 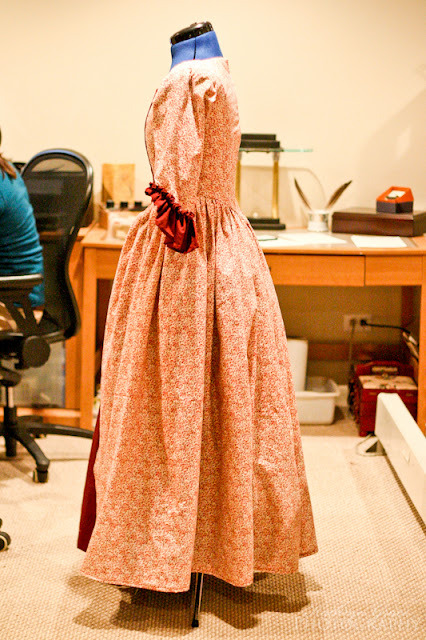 She wore it to Liberty Day (the same event Patrick Henry's costume was made for), and she looked absolutely gorgeous! 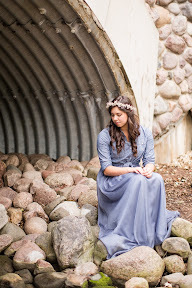 But what else would you expect when you put a gorgeous girl in a colonial dress?? I really need to get pictures of her *in* the dress, but for now, you'll just have to deal with only seeing it on the dress form. 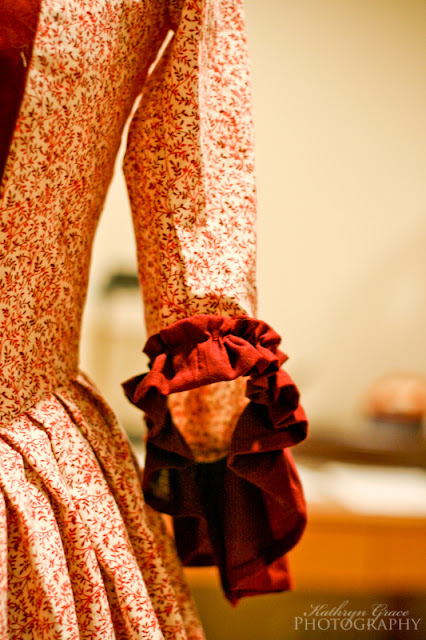 I adore ruffles on sleeves. ...and I also adore pleats. Alright... that should bring you all up to date on my life. :) Now get off the computer and enjoy the beautiful spring weather! Very nice! I'm glad to see your feeling better. 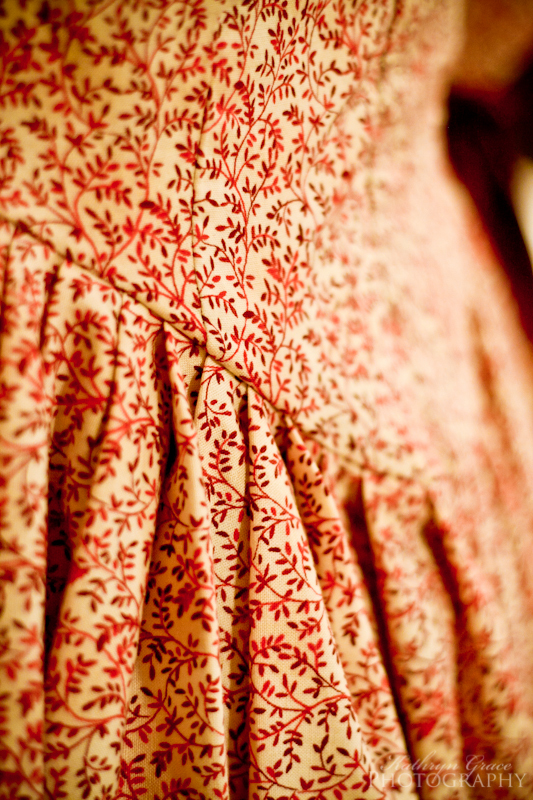 Also, that Colonial dress color is so pretty, and I just love all the ruffles. Enjoy your spring weather, we are having summer weather here in the mid 80's already! The 1912 undergarments are lovely. Too bad they have to get hidden by the dress! Sadly, I never really got to see the dress at Liberty Day. I guess we'll have to have her out for a photo shoot? 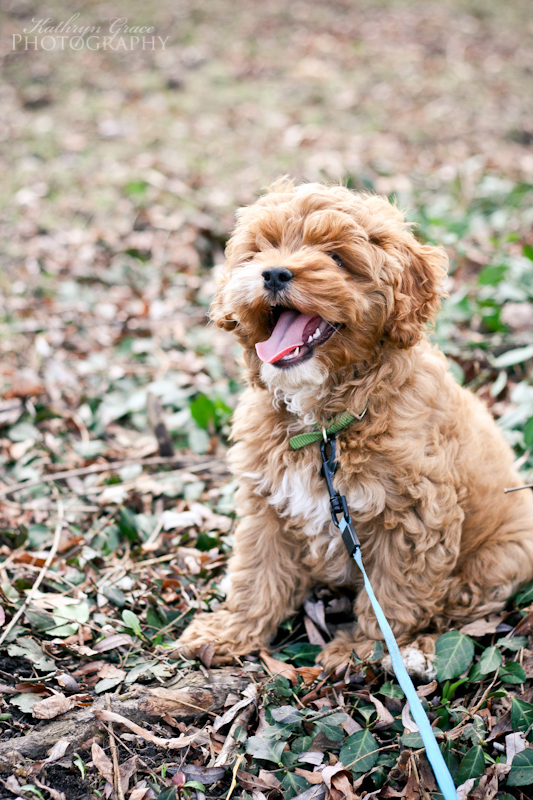 Puppy = excellent photo subject. Such a lovely corset, I like the colored bias tape. I have a pattern to make a corset but I'm still too scared... Love the colonial dress too. It was great seeing ya'll over the weekend! Esther - Aren't ruffles great? I love them! Actually we are in the mid 80's here as well, but we just got a quick shower, so might cool off a little from that! Rose - Thank you so much! I agree, he is pretty adorable! Laura - Oh well... even though no one sees them, I still had a blast making them! Thanks so much! Anna - Thank you! It isn't all that difficult to sew a corset, especially if you have a good pattern, it's just getting over the first step of sitting down and starting it! I was a little nervous my first time too! HAVE to do some bouncing! Perhaps it wasn't the wisest decision on my part to dance at Liberty Day, but it was so much fun! :) Many thanks for asking me! It was great see ya'll too! Thank you for accepting! :-) I'll be looking forward to the next time we're up there! I'm sorry that your were feeling so poorly! That's horrible; I hope you are blessed with good health now! 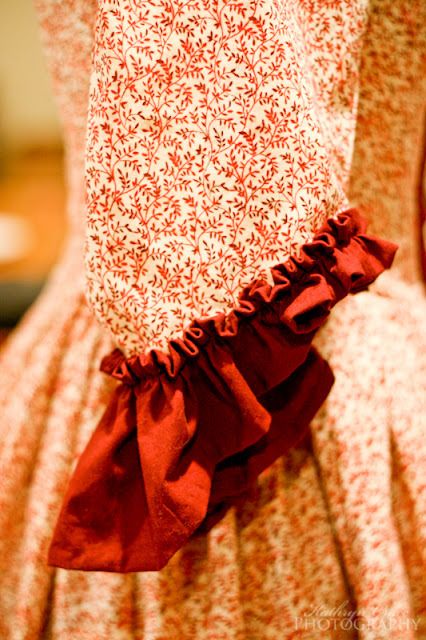 I LOVE that red-sprigged fabric! 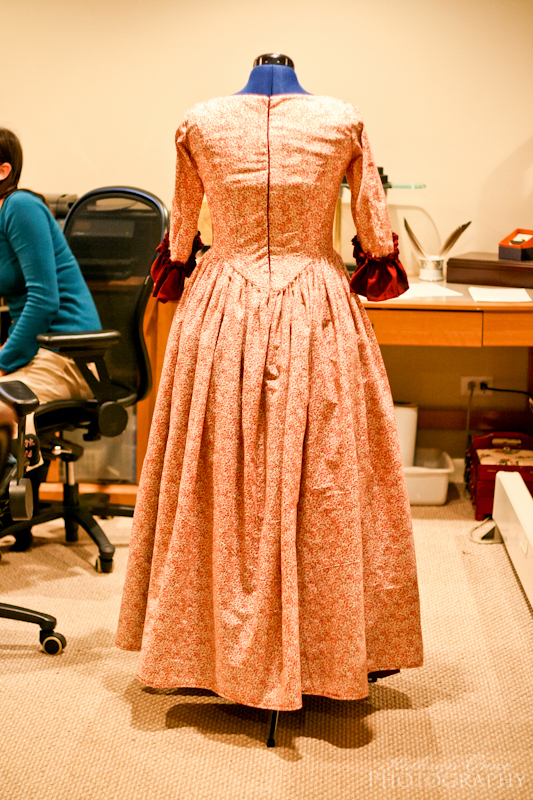 That is a very authentic-looking and lovely Colonial gown! 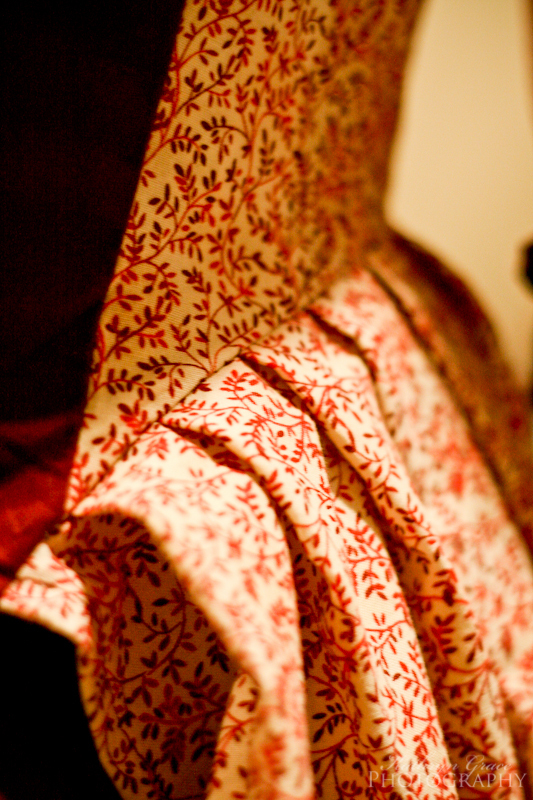 I just love how you can sew such lovely cloths! And your dog is the cutest puppy! Nonpareils - Yes, I'm all better now! Thanks for asking! 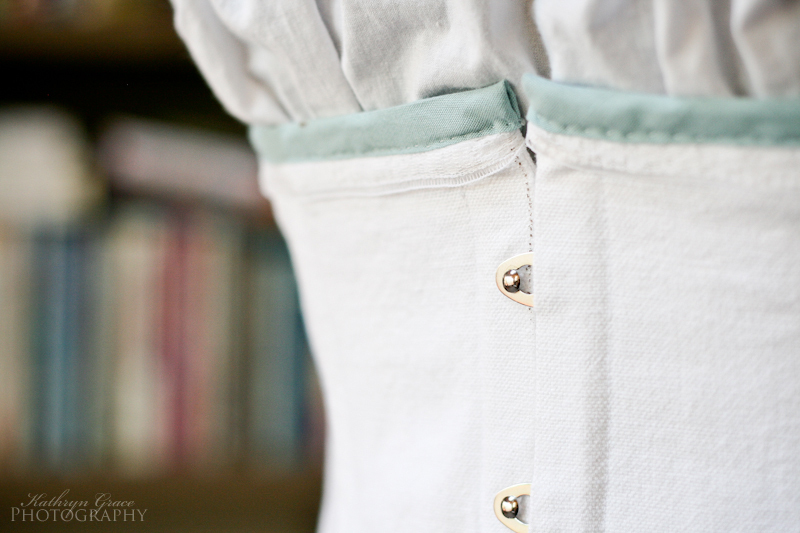 Somehow, I don't find sewing corsets any harder than sewing a bodice - the only thing different really is putting in the boning casings, which are just sewn lines. Fitting can be difficult at times, if you don't have someone to help you. :) Isn't the fabric darling?? I just love it! I'm taking the plunge and am about to make a victorian corset (simplicity 9769) What boning did you use and where did you get it? 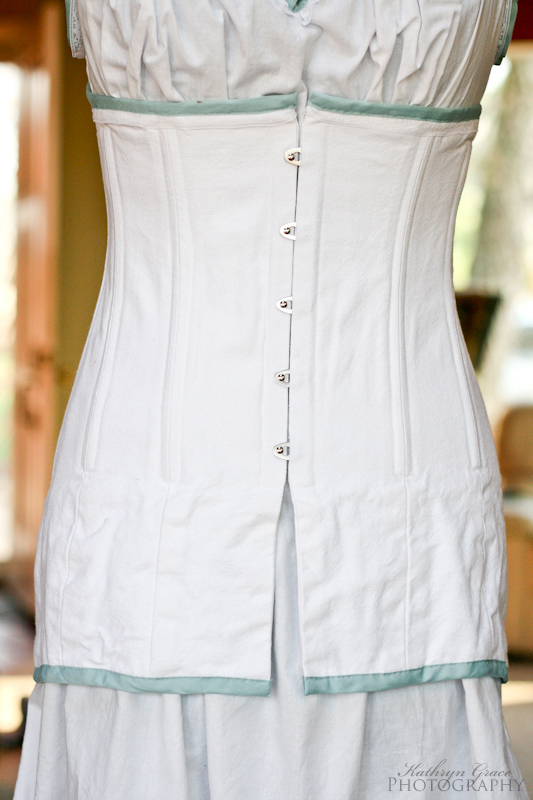 And one more question, should I use metal grommets or hand sewn eyelets? I already have a grommet maker. It such seems easier and stronger to do the metal. It seems like over time the laces would stretch ago it the fabric. But I don't know. Any suggestions? Thanks! And one more question, why did you do hand sewn grommets instead of metal? it seems like the lacing would stretch the fabric over time, but I don't know that, just curious. Love your 1950's dress! Great colors! I love sewing as well. My family and me are going to Williamsburg in Feb next year. Making costumes for the whole family.